Before dawn, the ringing of the bell announces the beginning of the day, which opens with a prayer. In Church the monks recite the nocturne and finish with matins. It is then the start of the working day. Each monk has his own job to undertake and work continues uninterrupted until Mass, the high point of monastic life. At lunchtime the Angelus is rung: in the refectory the abbot blesses the food and the reader, as laid down in the Rule, reads a passage from the Holy Scriptures during the meal. After a simple and quick meal the Monastery is immersed in silence: it is the time for compline, the evening prayer, the last act to conclude a long and industrious day for the monks. From compline to the next morning, when the nocturne is finished, no one is permitted to break the silence without a very important reason. This is the life inside of the monasteries, this is the spirit that reigns in the Abbey of Cava de' Tirreni, one of largest and important of the Order. It is between the walls of the Abbey that are protected codes and incunabulums of inestimabile value, and in the rooms are kept the older texts of the High Middle Ages. There is also something thinner: that incredible magic that allows to complete a travel backwards in the time and to find itself to live in another very remote age. Distant in the time but very near in the spirit, because in few places it is possible, stopping a moment to the shadow of a tree or in the fresh silent of a Choister, to feel so hard and real the presence of another very far millennium. 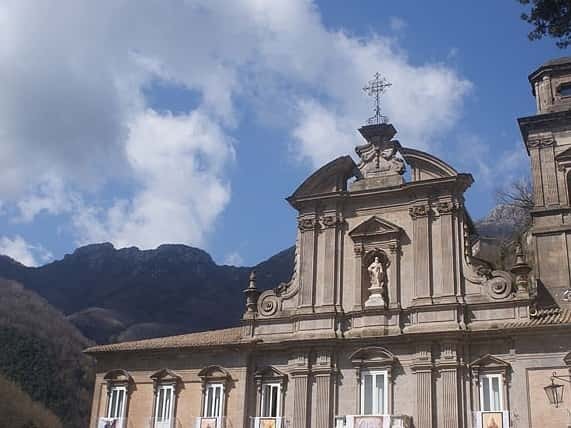 The Abbey of the Benedictine Fathers in Cava de' Tirreni rises up in a valley not very far from the Amalfitan Coastline. The Abbey was founded in 1011 by Saint Alferio, a nobleman of Salerno. Very soon, under the third Abbot Saint Pietro, the Abbey became the centre for a flourishing congregation. The order Cavensis became a divine centre for spiritual fulfilment and expanded to encompass approximately 400 churches, abbeys and priories. Consequently it spiritual and secular influence spread throughout southern Italy. Credit should also be given to the patronage of the people of Salerno. During the first glorious three centuries, the initial four Abbots were recognised by the Church and canonised (Alferio, Leone, Pietro, Costabile), an other eight followed Marion, Benicassa, Pietro II, Balsamo, Leonardo, Leone II. Between the XIII and XIX centuries, the Faith began to decline due to the desire for material assets and an increase in robbery and violence. In 1394, popularity and faith increased and the Abbey became an Episcopal centre, a phenomenon if its time and was entrusted to the Abbots. Due to the lack of Holy Sisters and wealth, the Abbey was in 1497 combined with the congregation of S. Giustina of Padova. In the XVIII century, the Church and other parts of the Abbey were widened and reconstructed but there still remained medieval in architecture. The Abbey holds important archives containing approximately 15.000 parchments form the VIII to XIX centuries and the library which holds other precious manuscripts and incunabulum. As a result of the law of abolition (7 July 1867), the Abbey was declared a national and entrusted monument under the jurisdiction of the Abbots indefinitely. Today the Abbey holds many art treasures. The Benedictine Fathers that have inhabited it for a thousand years continue to carry on their work. Observering their holy orders, spiritual meditation through prayer and observing the doctrine of S. Benedetto. The Benedictine Fathers are also the custodians of the archives and library, they are hosts to many pilgrims, they provide ministerial services within the Abbey's diocese and play an important role in the formation of the clergy. enriched with many works of art from different ages, frescos, mosaics, sarcophagi, sculptures, paintings, manuscripts and priceless objects. The Benedictine Abbey Holy Trinity, would like to offer, through art, history, nature and culture, guided tours, to spend a day experiencing monastic life and moreover to walk along the narrow streets of the medieval village . The main itinerary includes the tour of the monastery, guided by the Reverend Father Abbot. The Basilica, constructed in the eleventh century by Abbott S. Pietro and consecrated by Pope Urbano II on 5 September 1092. The Basilica was completely reconstructed in the eighteenth century and designed by Giovanni del Gaiso. The pulpit of the twelfth century remains and the Chapel of the holy fathers replastered and covered in polychromy marble in 1641. Chapel of the antique Basilica. Remarkable altar front in marble of the eleventh century, the sculpture of Tino of Camaino and the flooring in majolica of the fifteenth century. The Cave of S. Alferio housing Chiostro of the XIII century, situated below an overhanging rock face, upon two marble pillars with Roman capitols and raised arches. Hall of antique canons, adjacent to the Cloister, gothic from the thirteenth century, housing sarcophagi and frescos of different ages. Cemetery: the crypt is from twelfth century and the cylindrical pillars in masonry in an evocative effect. The Chapel of San Germano Museum, of 1280, a splendid hall from the thirteenth century, in which there hangs paintings, sculptures, sarcophagi, chorales, and copies of documents from the archives. The Apse, a hall with various attributes, wooden chair backs from 1540, frescos on the walls from about 1642, flooring in majolica tiles from 1777 and the ceiling from 1940.